The journal is a peer-reviewed, international and interdisciplinary research journal. 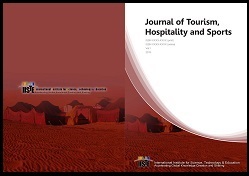 The scope of the journal includes, but not limited to, cultural tourism, hospitality and event management, new technology and growth of tourism sector, tourism, development and sustainability, ecotourism, creative tourism, experiential tourism, sports industry, sports management, etc. The journal also covers interdisciplinary research across the topics on development, education and sustainability.